When you have a Yorkshire Terrier, taking care of the coat is a crucial task to not only keep your dog looking fantastic, but it also plays a huge role in both skin and coat health. If you meticulously groom your Yorkie but are not satisfied with how your little guy or gal looks, it may very well be due to not having the best brush and comb for your Yorkie's coat length and/or not using the most beneficial brushing spray. In this section we will go over the elements that are most important: a comb, a brush, a leave-in spray, and a mat-remover tool. Once you have the best ones for this breed, you’ll find that brushing your puppy or dog and ending up with a super healthy, shiny coat is as easy as a breeze. It’s a bit amazing the damage that incorrect grooming tools can inflict. Sometimes you will notice damage right away. But in other cases, it will be a culmination of what a brush does over time. One day, you’ll take a look at your Yorkie and wonder ‘what went wrong?’. Luckily, this breed has relatively quick growing hair and has a coat that responds well to the tools used on it. Texture: In worst case scenarios, the wrong brush (like those meant for high-shedding breeds) can strip off hairs. And, other times, a brush can cause the hairs to frizz or split which can easily make a Yorkie look unkempt. In these cases, owners often back away from brushing, assuming that the more they brush the coat, the worse it will be. But, the key in this is to use the right brush to enhance the texture of this breed's coat. If so, the more you brush, the better your Yorkie's hair will look. Shine: Every day, around the clock, a dog’s body is producing oils. Minuscule amounts are released through the skin pores. This is the body's natural way of trying to keep skin moisturized. When you bathe your Yorkie, you rinse this away and start with a clean slate. However, in between those baths, when you are brushing your Yorkshire Terrier, the brush you use will either leave those oils trapped near the skin (doing nothing advantageous for the hair and often producing an odd smell once enough has accumulated) or it will distribute them from root to tip (one element in helping to produce shiny, healthy hair). Compliance: It’s difficult to properly brush a Yorkshire Terrier if the puppy or dog has no patience for allowing you to do so. And, after all, a half brushed coat is going to look just that. A huge factor in this is a dog's level of comfort while the grooming task is being done. Fortunately, some of the best brushes for the Yorkshire Terrier breed will actually feel good for a puppy or dog. Quality bristles or pins and proper tension of the cushion can offer what feels like a nice body massage or light scratching. And most dogs simply love this. There are 3 basic elements of brushing a Yorkie and this holds true no matter the dog’s age or if the coat is short, medium or long. If you follow implement these 3 elements and use the best grooming tools possible, you’ll soon see that you fall into a rhythm. Your Yorkie doesn’t mind the attention (it feels good), things move along quickly (you’re not stopping to worry what the tools are doing) and it becomes second nature to hop from combing to spritzing to brushing. Allow you to find any small mats (tangles). It is crucial to find any mats while they are still small and easy to remove. These can grow quite quickly, pulling in more hairs each day. And, if there is a mat and you snag it with the brush because you didn't find it with a comb, it can hurt. Just as importantly, combing will prep the coat for brushing by separating the hairs, allowing the brush to properly do its job. For these reasons, the first step is to carefully comb each section. 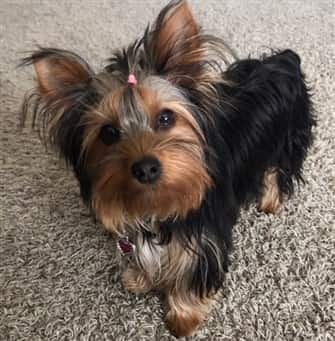 What is the best comb to use for a Yorkie? You will want to use a two-level steel comb. Stainless steel is recommended since it is durable (cheap steel will warp, bend, and/or rust). The two levels means that each end or side of the comb will have different widths of spacing between the teeth. You will want narrow spacing on one end; this is used for the face and small areas like the paws where hairs are more delicate. You will want medium spacing on the other end (too wide of spacing will negate the purpose of the comb) and this is used for the main body, chest, neck and tail of the Yorkshire Terrier. For puppies and adults under 10 pounds, the Lil Pals Double-Sided Comb is ideal. This is very durable, comfortable to hold, and sized perfectly. And, for Yorkies on the larger side that are 10 pounds or over, the Andis 7-1/2-Inch Two-Level Steel Comb usually works very well. Choosing the right brush is crucially important for overall appearance and skin and coat health. You will find that the best brush for your Yorkie, depending on coat length, will lend toward proper coat texture, healthy shine, good distribution of body oils, and stimulation of hair follicles to promote hair renewal and growth. In essence, the coat will look fantastic and both skin and coat will be healthy. The best brush for Yorkies with shaved or very closely trimmed coats is a boar bristle brush like the Chris Christensen Soft Tufted Boar Brush . The bristles work well to massage the skin without being abrasive, work well to loosen debris from the coat, and does a good job in distributing body oils and adding shine. This is fantastic for Yorkies of any size, with a bristle area of approximately 4 inches long. The best brush for Yorkies with moderate to long coats is a pin brush with comfort tips. This sort of brush will not snag on medium to long hairs and works well to reach down through the hairs. Rounded comfort tips will help ensure that the brush is gentle on the skin; however, be sure that you go through the coat carefully without pressing down overly hard. High quality pins – Pins on inferior brushes will bend and/or recess back into the cushion. Once either of these two things occurs, the brush will no longer be effective. Rounded pin heads – Without this, the brush can scratch a dog's skin and this can cause discomfort. Tension – Too strong of tension in a brush can cause discomfort and irritation to a Yorkie’s skin. Yet, if the brush tension is too weak, you’ll be brushing in vain as improper pressure won’t allow you to work it through. Sizing – You will want the brush to be sized correctly to effectively reach all areas of the body, gliding from one spot to the next. You’ll also want it to feel good in your hand. For Yorkshire Terriers of all just about ages (other than young pups that have short coats and thus require a bristle brush; see previous), a fantastic pin brush to use is the ConairPRO Small Pin Brush for Dogs . Create a nice soft texture and add shine. Help the coat repel dirt, debris, contact irritants that can cling to the coat such as lawn care chemicals and airborne allergens like pollen, and even small splashes of urine. Add a layer of protection from environmental elements including dry winter air and damaging UV rays of the sun in the summer. Help prevent split-ends and breakage - When you ‘dry brush’, you risk causing split ends. Each individual hair strand of a Yorkshire Terrier has an outer protective layer called the cuticle. The tip of each strand is where that layer is most vulnerable to damage. It can wear away due to external stress such as brushing. Protect the coat from contact friction - All day long your Yorkshire Terrier’s coat is coming into contact with things… the carpeting, flooring, furniture, bedding, etc. And each time the hair rubs against surfaces, it can wear down the hair's natural protective layer. There can be static issues and over time the coat can lose its shine. 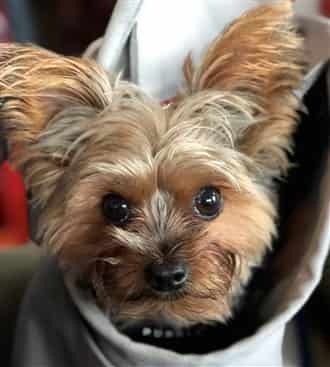 Help your Yorkie smell clean and fresh - Sometimes it's hard to keep a dog smelling nice in between baths, but the right leave-in spritz can make a huge difference in this regard. So, when you brush your Yorkie, do so with a protective spritz. It will be just the thing to give you the desired outcome and will continue to work after the brushing is done. 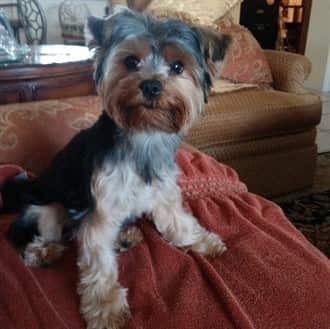 If your Yorkie's coat is shaved or trimmed very short, you can spray some of the product into your hands and then work it into the coat before you brush. If your Yorkie's coat is a medium to long length, spritz as you go, section by section. Do NOT use a lot (a little goes a long way) and start at the roots, working the brush down in nice sweeps that distribute the product through the hairs. If your Yorkie has a very long coat, you may need to spritz again at the halfway mark for each hair section and then brush out to the tips. In general, under normal conditions, you can spritz each time you brush and if you are super busy and 3 or 4 days have gone by without a full body brushing, spritz a bit into your hands and scrunch it into the coat, making sure to get the hair tips. If your Yorkie's main issue is keeping clean and/ or tangles, The Stuff is a great choice. This does everything you'd expect it to do and has a light scent. And, if adding a nice fragrance while you brush is one of your top goals, Nootie Daily Conditioning Spritz is fantastic. This also has all the benefits previously listed but additionally has some delectable fragrances including warm vanilla cookie, cucumber melon, sweet pea & vanilla, coconut lime verbena, and Japanese cherry blossom. Before you brush your Yorkshire Terrier, you will comb through the coat to separate the hairs and check for any mats. But, what do you do if you find a mat? The worse thing you can do is ignore it. Mats occur when hairs become tangled. If this is left alone, it will not resolve itself. Rather, more and more hairs will be pulled into the knot. The mat will grow and skin will become pinched. 1) Try to work it out by hand. For this, slather your hands with your Yorkie's coat spritz (as long as it serves as a detangler; see previous under Spritz/Coat Spray) and gently try to undo the knot by pulling out just a few strands of hair at a time. This can take quite a while, so you may wish to take breaks before your Yorkie becomes restless. 2) If you cannot remove the mat by hand, the best thing to do is snip it off with a mat remover tool. This will ensure that the damage stays localized and does not spread to other areas of the coat. While no one wants to cut off a piece of their dog's coat, rest assured that if the mat is small and cut with a properly sharp tool, this will not be that noticeable and the hair will regrow. Be careful what you use for this. Some mat removers double as raking combs that go through the coat to remove the undercoat of dogs that have thick fur and you certainly do not want to use this on a Yorkshire Terrier that has a silky coat of hair. It's best to use something like the Hertzko Mat Remover which has a small blade area, those blades are curved with safety edges, and the blade itself is very sharp to effectively remove the mat in one go. 3) A mat is an indication that the coat is not being brushed often enough or that a detangler product needs to be used more often. So, this is your signal to make some changes. You may need to set reminders to brush your Yorkie (see next) or start using a better coat spray that works to prevent tangles. If you are using the right brush for your Yorkie and a light yet effective leave-in coat spray, there is no such thing as brushing too frequently. Removing stray dead hairs, debris, and possible contact irritants, massaging the skin, distributing body oils, and adding a spritz to protect the coat can only be beneficial and can be done each day. Do not necessarily let the appearance of the coat fool you. Even if the coat looks great and your dog looks super clean, that gorgeous coat may not stay that way unless you do a brushing on schedule. Maintenance is vital. For shaved or short coats, a Yorkshire Terrier should be brushed at least twice per week and at the very least 1 time per week. For long coats, 3 times per week with a minimum of twice per week is recommended. Which bones can a Yorkie safely chew on? This detailed page let's you know what to avoid & why and alternative options for pups and dogs that love to chew on bones. 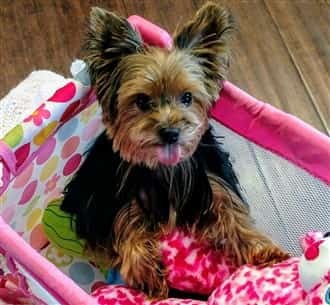 Tips to Keep a Yorkie Clean - Though they certainly have their place, baths are not the only way to keep a puppy or dog tidy and smelling great. 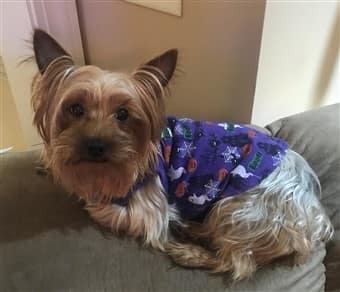 How to treat dry skin on a Yorkie - If your Yorkie's skin is dry, flaking and peeling and/or if there are flakes in the coat, this article addresses these issues & how to fix this. How to stop a Yorkie from digging - Is your Yorkshire Terrier a little digging machine? Tips & tricks to resolve this issue. The best snacks for a Yorkie - Super healthy options for optimal health & yumminess!